THE DISNEY FIFTIES - Walt Disney World Resorts. This 50s art print has been displayed in an actual guest room at Disney's Pop Century Resort for nearly 15 years and due to a recent remodel, it is now ready for a new home. Overall dimensions = 33 1/8" X 27 1/8", the internal display dimensions = 30" x 24". 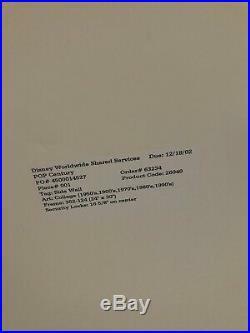 The back reads: Disney Worldwide Shared Services Due: 12/18/02, POP Century, PO #4500014527, Order #63234, Piece #001, Product Code: 26040, Tag: Side Wall, Art: Collage (1950's, 1960's, 1970's, 1980's, 1990's), Frame: 362-124 (24" x 30"), Security Locks: 16 5/8 on Center. The art print is protected behind lightweight plexi-glass, not fragile and real glass. The original wood frame is sturdy and intact with two original wall hang accessories attached to the back side. There are some blemishes, scratches, normal wear on the frame. This is a genuine Disney room piece. 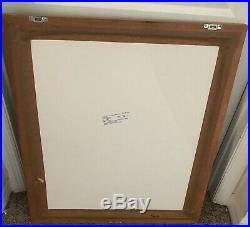 Overall a great piece of original Disney art and rarely found on the market!! The item "WALT DISNEY WORLD POP CENTURY RESORT PROP FRAMED WALL ART FIFTIES 50s" is in sale since Sunday, March 24, 2019. This item is in the category "Collectibles\Disneyana\Contemporary (1968-Now)\Theme Park Souvenirs". 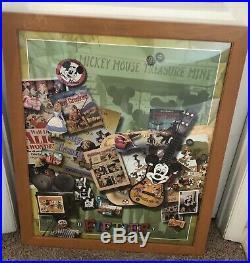 The seller is "mydisneyclosetandmore" and is located in Winter Haven, Florida.